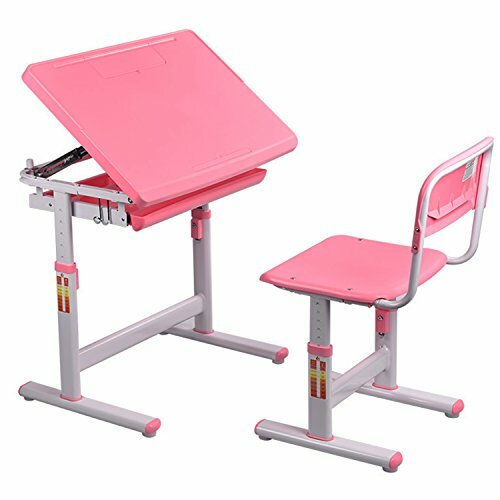 I STUDY Height Adjustable Children Desk & Chair Set is an ideal study companion for your kids. The height of the desk and chair is adjustable in order to have a perfect posture when sitting. Blue and pink color is attractive and fashionable for any home décor. Tilted tabletop satisfies different needs of reading, writing or drawing. The multi-functional drawer can maintain stationery with different classifications. A book clamp, the particular design, can clamp the book from sliding down after the desk plate is adjusted to a suitable angle for reading. When the desktop is stained by different of pens, it still can be easily cleaned. -Height of Table to Floor: 20.5"-29.9"
-The angle of the desk can be directly adjusted by hands. When it reaches to the maximum angle, you can readjust it. -Lock device: If it is needed to fix the desk at the giving height, the screw C can be used to lock the lifting device. -There are 7 gears for adjustment for different purpose. The drawer under the table top suits different styles of stationery storage. -Two handy hooks can hang backpack and water bottle. -The chair is designed ergonomically, so it can effectively improve the sitting posture. Easy to assemble.